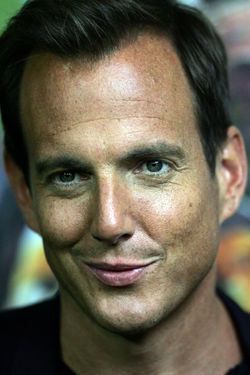 Will Arnett is a Canadian actor. Will Arnett has appeared in several films such as Semi-Pro, Blades of Glory and Teenage Mutant Ninja Turtles, and television series including Arrested Development and wikipedia:30 Rock. Arnett also works as a voice actor, playing roles in productions such as The Simpsons and Ratatouille. Will Arnett voiced Batman in The LEGO Movie, its sequel The LEGO Movie 2: The Second Part, and the spinoff film The LEGO Batman Movie. Dressed as Batman, Arnett also took part in a performance of the Everything is Awesome, a song from The LEGO Movie, at the 87th Academy Awards in 2015. Vern Minifigure based on actor's portrayal of the character. This page was last edited on 18 December 2018, at 22:30.